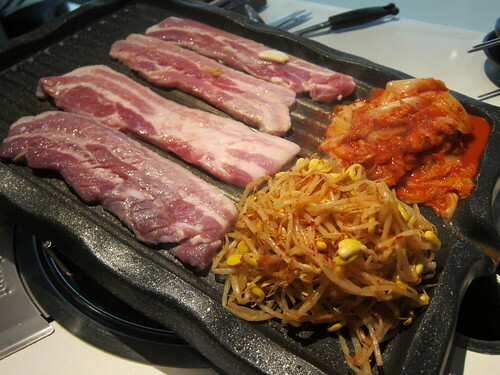 If you’re not into pork belly, there are a few other things on the table that you could savor at Palsaik Samgyupsal. I’m just not convinced that this restaurant is exactly your calling. You have to pretty much love pork belly to sustain a dinner with 8 flavors of it at its centerpiece -Â agree? Fortunately, none of my fellow diners were ill-informed, but equipped with nil-to-small lunches eaten that day. The number of marinades is a novelty for, yes, the sheer number. The garlic,Â miso and red pepper were the favorites in the group. The herb was unintelligible; the wine and curry flavors, fortgettable. But if you learn one thing from this post, remember that when you go back in and order the pork belly in the marinades you like the most, there are 4 strips that come with each individually-ordered flavor. Whereby the 8-marinade sampler comes with 1 strip each, we ended up essentially doubling our dinner when we wentÂ with seconds onÂ 2 of our favoriteÂ flavors. The secret’s in the sauce, or marinade, if you will. When Krista asked about Palsaik’s smoker when they brought out a complimentary sampling if their “smoked” flavor, our server clarified that it was a sauce. I wasn’t too surprised. But the sides are nothing to gloss over. 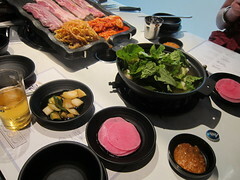 The banchan, while basic and few in variety, were just enough. Much like AYCE in my Korean dining experiences, gone are the superfluous small dishes earmarking quantity over quality.Â The pink, pickled daikon wraps; shiso leaves; and romaine leaves were really the most important accompaniments (allowing for the construction of real Korean tacos, as I say). The green onion salad, too -Â as if they were all a reminder to leave room for the pork belly. aThe hot seafood soup simmering over the table’s burner was a delicious one, leaving me craving forÂ more. We also ordered a bowl of cold, springy buckwheat noodles that I supplied with as much mustard asÂ my sinuses desired. I always love a good bowl of cold noodle soup toÂ lighten upÂ the meat load – and the chili soybean paste I put on practically every bite of pork. So much for those marinades. Habits are just so hard to break. And so. We pressed on through 16 strips of pork belly, all 5 of us.Â The service was team-oriented and pretty capable, with someone coming by periodicallyÂ to magically scrape the carbon traces off our drainingÂ grill with a daikon-cube-on-a-stick, curate our bellys on the grill and even cut them up into bite-sized pieces with scissors. The place is new and modern, even by outside-of-Koreatown standards, which means new fans in addition to black and white, minimalist furnishings.Â I surprisinglyÂ wasn’t as compelled to relegate my clothesÂ to the hamper as urgently as I was used to. And the damage despite inadvertantly overordering food and including 2 bottles of Hite? Just $25 per person including 20% gratuity. Protip: Ladies, your seats (tree stump-like stools) open up so you can keep your purse safely inside. 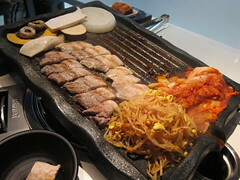 This entry was posted in Food, Koreatown, L.A. and tagged 8 flavors, Korean BBQ, Koreatown, Ktown, Palsaik Samgyupsal, pig, pork, pork belly. Bookmark the permalink.